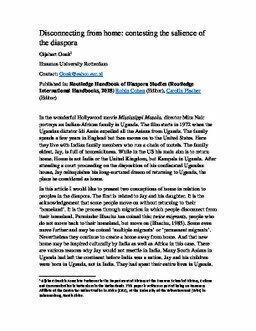 In this article I would like to present two conceptions of home in relation to peoples in the diaspora. The first is related to people who move on without returning to their ‘homeland’. It is the process through migration in which people disconnect from their homeland. Parminder Bhachu has coined this: twice migrants, people who do not move back to their homeland, but move on (Bhachu, 1985). Some even move further and may be coined ‘multiple migrants’ or ‘permanent migrants’. Nevertheless they continue to create a home away from home. In the second conception of home and homeland, we acknowledge that home is not a natural calling. Jay and his family move on to the United Kingdom and later to the United States for two major reasons. I argue that the availability of networks is important, not the homeland as such. Nevertheless, many first and second generation people in the diaspora do share a strong connection with the motherland because of family relations, collective memories, and myths and identification with the nation. But what happens if they do reunite with their places of origin and family members? More often than not, after their arrival in their homeland they face ambivalent feelings. It is not the home they expected. It is a home that may be friendly, but different. This ambivalence is experienced not only by the returnee, but also by those who were left behind. We present a few of these examples in this article.